How Was Your Trip To Portugal, Nienke Krook? I’m loving these interviews with people who’ve travelled in Portugal. This week’s guest proves it’s possible to have a great time here on a budget by camping and using the money saved to hire a car for exploring off-the-beaten-track. Hi Nienke, can you tell us a bit about yourself, please? Hi! I’m Nienke [neen-kuh], 29 and from Amsterdam. The last 2 years I lived in Sydney, where I worked as a hostel receptionist , travel agent and social media manager. Now I’m back in Amsterdam and I’m currently looking for more work in the online and travel world. I visited Portugal in 2010 with my boyfriend. We were there for 12 days. We took this road trip for our summer holiday. We flew with Ryan Air from Eindhoven (The Netherlands) to Faro. It was a 4 hour flight. We then picked up our rental car from the airport and returned it in Porto, where we ended the trip after 12 days. We brought our own tent, so in each town we looked for camp sites. On the last day in Porto, we treated ourselves with a private room in a hostel. Before we left, we wrote down some addresses of camp sites from eurocampings.net. Most of the camp sites were well maintained with good facilities. One of the best was ‘Parque de Campismo de Lisboa‘. We got to pitch our tent in the middle of the woods and were surrounded by squirrels, great! The hostel in Porto was called the ‘Wine Hostel’ and it was perfect. Ideal location, friendly staff and a comfy room. I would definitely recommend staying here as well. We rented a standard car with Europcar. It was perfect for this trip. We did have air-conditioning in the car and were really happy with that. There is a beautiful series of travel guides in the Netherlands, called ‘Capitool’. The guides have loads of pictures and good historical background info. It helped me a lot planning our Portugal trip. I also went onto Google Maps to find out how long the driving distance was between all places, to make an itinerary for our trip. I had never been to Portugal, so I was excited to see what buildings, food and nature I could find there. I love taking road trips too, throwing a tent in the car and explore as you go, so that was something that I most looked forward to. It was a bit hard to find, but I would recommend visiting the Roman Site in Conimbriga. I wrote about it on my blog too (www.thetraveltester.com/archaeology-travel-conimbriga-portugal). 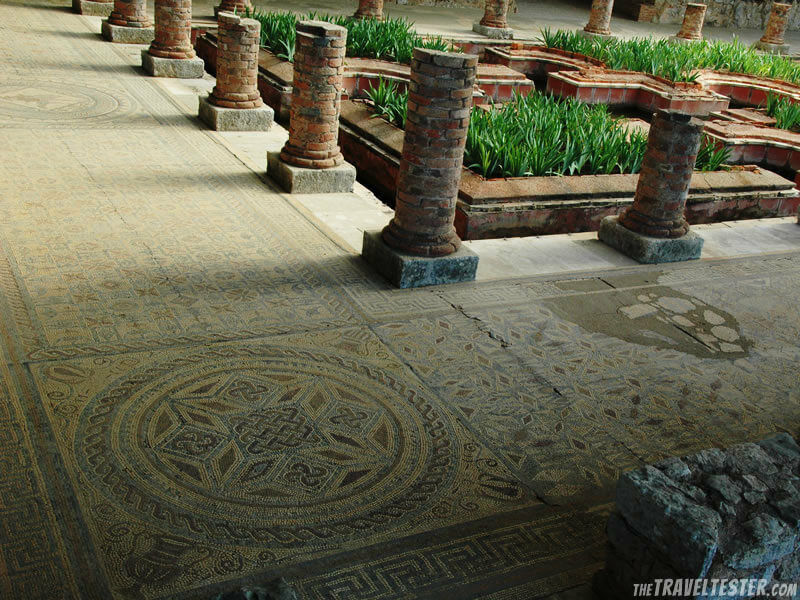 This archaeological site is big and full of ruins and amazing Roman mosaics, most in great condition. Not really a place, but I advice people to not do too much sightseeing around midday in summer. It gets really –and I mean really- hot! Do what the locals do, take a siesta and explore in the early morning or late afternoon instead. Camping was a great way for us to save money. We also bought a tiny BBQ from a camp shop, got meat and veggies from the supermarket and made ourselves some really nice (and cheap) meals a couple of days. Is there anywhere or anything that was a letdown? Why? After landing in Faro, we made a little detour to the East to explore Tavira and Monte Gordo. While Tavira was a nice fisherman’s village with some great buildings, Monte Gordo was a very touristy and crowded spot. It’s one of the places the local people celebrate their holidays too, but for us it had little interest. Another letdown was in Porto, when we wanted to visit the Casa da Música on our last day. It just happened to be that they were shooting the auditions of Portugal’s Idol series, so instead of a quiet and informational tour about this concert hall (designed by a Dutch architect), we were met by hundreds of screaming wannabe-stars and camera crews. Funny, but definitely something we have to go back for. We loved the Cataplana. It’s a local seafood dish that is popular on the Algave Coast. 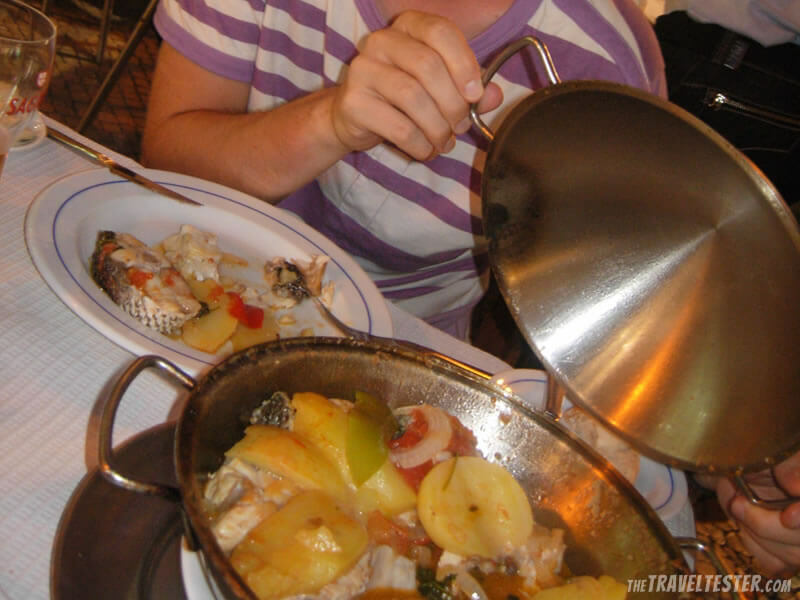 The name of the special cookware that is used to prepare the dish is also Cataplana. It’s a copper, clam shaped pan that’s hinged at one end. In Porto, we also enjoyed a typical ‘Rotiseria’ BBQ buffet, where waiters come to your table with skewers of meat until you burst, basically. There was a salad bar and the meat just kept coming. Entertaining and delicious! Did you buy any souvenirs? What / Why not? Because we were flying home we couldn’t bring any wine, which was a shame. I did buy the standard painted rooster-magnet and I got my brother a little drum as I always try to bring him a local instrument from my travels. Culture. Food & Wine. Natural Beauty. Having more time to really get to know the cities we’ve visited. Because we had limited time and had to return our car on a certain date, we had to keep moving all the time. Would you like to come back to Portugal? If the answer’s yes, where in particular? Absolutely. It’s a beautiful country and perfect for road tripping and camping. I would love to see more of the National Parks and the fantastic coast. Blogger bio: Nienke’s blog, The Travel Tester, focuses on creating travel memories through photos, stories and souvenirs. Every Friday, travel bloggers get interviewed about their childhood travel memories and on Pinterest, the Travel Tester Travel Style Boards are the most popular. On Twitter, Instagram, YouTube and Facebook, you can find Nienke on @thetraveltester. Would you like to be interviewed about your experience of visiting Portugal? Get in touch and I’ll send you the details. Next Post: How was your trip to Portugal, Sheila Sim? Thanks Julie and Sami. I had a great time in Portugal. Living so close, it’s strange I hadn’t visited before, but now that I have, I will definitely come back!! Wonderful that you enjoyed your trip through Portugal Nienke.